I’m not a fan of muskmelons in general, but a decent honeydew can woo me into enjoying it. Combining a sweet, ripe honeydew with lemony sorrel and nutty almonds makes an excellent salad, even for the unenthused melon eater. Serve it with breakfast or brunch, or as a simple dessert after a spicy meal. There are many approaches to slicing a melon– do what works best for you. Some people prefer to slice, then cut off the rind; others slice off the bottom, cut off the rind, and then cube. Just be sure to wash the melon well before washing to help prevent any contamination of your clean melon with bacteria from the outside of the rind. Sorrel is occasionally found at a gourmet market, or farmer’s market, but it is often found in your yard. This is a pretty good picture a commonly found wild sorrel. Another one has wood sorrel pictures partway down the page as well. Wood sorrel has a similar flavor, but different texture. Always make sure that you can properly identify wild plants before eating them. A thoroughly ripe honeydew won’t need a dressing–the juice alone will suffice. With an underripe melon, you can add the juice of half a lime mixed with 1-2 teaspoons of honey to highlight the fruitiness. Don’t skip toasting the almonds: their depth adds a nice contrast to sweet and sour flavors. 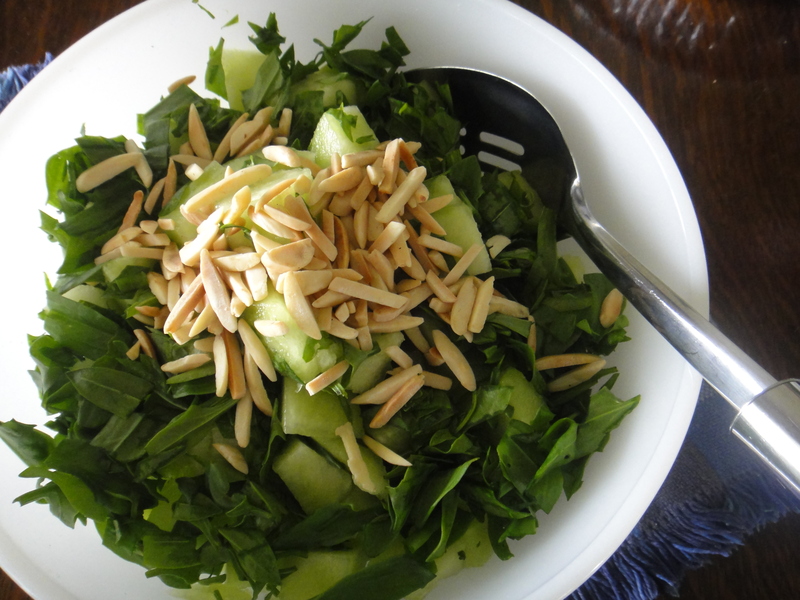 Toss the honeydew with the sorrel, and top with almonds immediately before serving. Thanks for the link to sorrel. I really didn’t know what it looked like.